"I felt "fantastic" after surgery.ï¿½ I was scared for no reason." 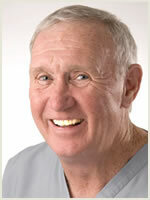 Dr. Sullivan founded our periodontal practice in 1978. Dr. Sullivan is originally from the Boston area and attended Assumption College. He received his dental degree from the University of Pennsylvania, School of Dental Medicine in 1974. A two year general practice residency followed at the Veteran's Administration Hospital. To become a Specialist in Periodontics, two more years of training and education at the Veteran's Administration Hospital in New York resulted in awarding of a Certificate in Periodontics. Dr. Sullivan continues his commitment to continuing dental education by co-founding "Drs. Sullivan, Yasner and Kazemi's Study Club" which brings high quality courses to South Jersey dentists and their staffs. Dr. Sullivan is a staff member at West Jersey Hospital, a member of the American Dental Association, the American Academy of Periodontology, and the American Dental Fraternity. Excellence in patient care, wonderful communication skills, close coordination with referring general dentists and dental specialists and a great sense of humor have all contributed to Dr. Sullivan's success. When not practicing Periodontics, you can usually find him playing golf, rollerblading, or spending time with his family.